The thing is – you deeply desire to do what’s best for your kids, but you worry that you can’t. Sometimes it’s all you can do to survive from one day to the next. Single & Parenting groups address these concerns. You’ll discover how to deal with your deep-down worries and your day-to-day struggles. You’ll meet with other single parents to learn and discuss some amazing parenting strategies and hope-filled insights. Our group is led by Colleen Marek and meets every Monday at the Monessen Public Library. There is a $15.00 book fee. Contact the church office at 724-929-9290 if you need more information. 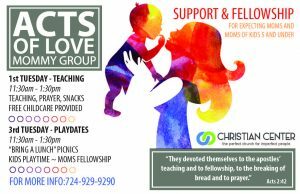 Come and fellowship with other moms at the Christian Center on the 1st and 3rd Tuesdays of each month. The first Tuesday of the month gives you an opportunity to receive biblical teaching as your children are taken care of with free childcare. The teaching takes place in the Impact Room/Nursery. The third Tuesday provides a group playtime for all the kids and a fellowship time for the moms! Everyone meets in the Fellowship Hall. There is no registration fee. Contact the church at 724-929-9290 for more information!